Two of Serie A’s more tactically interesting sides met at the Artemio Franchi stadium in Serie A’s 13th matchday on Sunday the 22nd of November. Fiorentina were on the back of a 3 game winning streak having scored 8 times in the process. Even more impressively they sat at the top of the table having won 9 of their 12 league games, netting 24 times along the way as they made an excellent start to life under new manager Paulo Sousa. Empoli meanwhile, also under a new manager in Giampaolo, had made an average start to the Serie A season with 4 wins, 6 losses and 2 draws in their 12 games thus far. As we saw later on in the season they grew into one the most tactically intriguing sides in Europe continuing the great work of former manager Maurizio Sarri. Much of the first half was characterised by Empoli’s strong collective defensive display as they not only prevented Fiorentina from scoring but also prevented them from creating any threatening situations. As ever with a strong defensive system the work began from the front. Against the home side’s back 3 Empoli’s forward pair of Maccarone and Livaja had clearly defined roles within the context of the team’s general defensive aims. Like several other defensive teams Empoli attempted to force opponents into a wing-oriented construction and general possession game. In order to make this happen the forwards had to work to prevent the 6 pair of Vecino and Suarez from receiving passes in the centre whilst maintaining access to the centre backs. Notionally this would be very difficult given that the 3 Fiorentina centre backs combined with the double six gave them a numerical advantage over the two forwards and the assistance of the 10 Saponara. However they managed to neutralise this potential problem area in the formation match-ups with a combination of clear coaching instructions and reference points. One such clear instruction that formed the basis of several of their defensive mechanisms was to occupy the 3 closest vertical lanes to the ball. This meant for example that when the ball was on the flank they would shift over to occupy that flank, the nearest half space and the centre. This highly ball-oriented approach created strong levels of defensive compactness. More importantly this gave Empoli the ability to condition Fiorentina’s possession game. With their high ball-orientation they left a lot of space in areas on the far side of their block instead focusing on securing the areas around the ball with high local density. This naturally encouraged Fiorentina to circulate the ball in a horizontal manner with the hope of accessing these spaces. However Empoli paired their strong defensive compactness with intense ball-oriented shifting which meant that it took them minimal time to compact the areas around the ball even after switches of play. Key to this was a strong usage of their full-backs and wide midfielders in pressing. They showed strong anticipation as they broke off from the chain and moved into wide areas whilst the ball was travelling. This was vital in reducing the efficacy of Fiorentina’s wide attacks as they were often in position to prevent Rebic or Alonso from turning when they received the ball, in turn forcing them to play backwards. With the ball being such a big positional reference point for Empoli their defensive mechanisms followed suit. 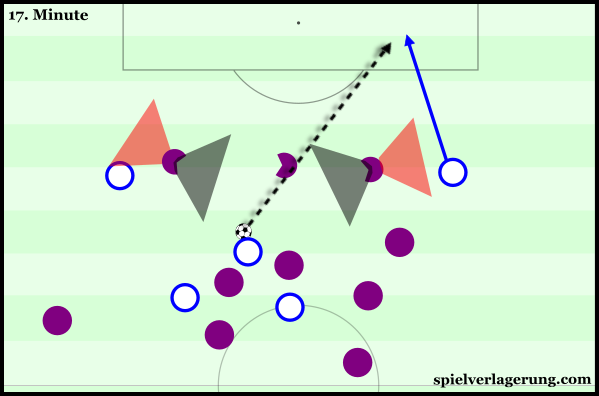 With the ball on the flank the two forwards would shift to maintain access to the two closest Fiorentina centre backs, leaving the long switch to the third centre back open. Saponara would remain behind them with his presence not needed in the first line and situationally mark Fiorentina’s ball-near 6. The role of the ball-far forward was fairly complex as they had to maintain access to both Roncaglia (Fiorentina’s central defender) and the midfielder behind them. In order to do this they took up “half and half positions”, which is simply remaining in the space between their two opponents. With the ball in the middle however the two forwards would move into their respective half spaces and Saponara would move up and create a 3-chain first line of defence to establish access to the central centre back. GIF showing the typical ball-oriented movements of Empoli’s defensive lines. In response to Empoli’s strong defensive compactness and their cleanly executed ball-oriented shifting Fiorentina experienced great difficulty in consistently progressing attacks. On the rare occasions they managed to progress directly from the defence to the midfield pair they were unable to evade the incoming pressure from Buchel or Zielinski. The progressions they made were largely wing-oriented with Alonso or Rebic being the main recipients of passes from the defenders. They often received the ball with a sub-optimal dynamic as they had to move backwards to create the angle to receive from the defenders. With Empoli’s high ball-orientation and compactness the only connections that were left back into the centre were provided by Fiorentina’s defenders. This led to drawn out build-up periods and their inability to penetrate meant almost every receiver received the ball with the entirety of the opposition block in front of them. One of the main reasons they struggled to create access to the midfield and generally create advantages against Empoli’s defence was their lack of effective dynamics. No matter what type of defence a team faces dynamics are necessary in order to create advantages and general offensive potential. These types of dynamics however may differ in nature according to the opposing defence. Against a man-oriented defence the co-ordination and speed of movement is very important given the opponents’ focus on coverage of direct opponents. When faced against more zonal defences however the speed of ball movement is more important given their greater ball-orientation. However, certainly when against a zonal defence, the appropriate dynamics are interlinked as efficient movement off the ball is necessary to facilitate quick ball circulation. Fiorentina however lacked either of these. The static nature of their central players meant they did not often manage to evade the cover shadows of Empoli’s forwards and midfielders. The static nature of the midfielders combined with the previously poor dynamic in wide areas led to a somewhat sluggish and harmless ball circulation. There were a few occasions where Sousa’s men managed to connect their wing progressions back into the centre via the midfielders. These movements came through rotary movements and combinations between Rebic and Valero. In these moments Valero would move diagonally towards the flank to receive passes behind Rui attracting his and Buchel’s attention before returning the pass to Rebic who could now move infield. Although these attacks generally came to nothing they had the potential to create dangerous situations. With a greater strategic focus on these movements they could have accessed the midfield more frequently and potentially create scoring opportunities. These issues were in stark contrast to some of the stronger Serie A outfits in possession. Whilst Fiorentina often cover large spaces with their positional structure they lack the connections that the likes of Empoli and Napoli thrive on. These connections they create give them the basis to combine quickly and these interactions are highly strategic. The speed of their combinations give the opponents’ less time to react in turn making access far more difficult to create. Furthermore the quick shifting of the ball’s location poses a great challenge to their opponents’ visual focus. The defenders’ aim to have constant view of the ball becomes far tougher to achieve and requires more attention from them. This also means that movements around them are less likely to be covered well in turn making the creation of angles for line breaking passes far easier. With bigger distances between their players Fiorentina do not use combinations as often and generally the efficacy of their possession game is harmed by their inability to shift their opponents’ positioning, visual focus and general orientation quickly enough. This affords their opposition more time to prepare themselves against subsequent actions. A potential solution for the home side against Empoli’s coverage scheme would be adapting the positioning of Suarez and Vecino and in turn the wing-backs. One of the issues Fiorentina faced was that the 6 pair were not occupying spaces that made cover shadows difficult to use for the likes of Saponara, Maccarone and Livaja. This meant they could rather easily press the centre backs whilst covering the passes into midfield. However they could have cause some issues by moving the midfield pair slightly wider and possibly moving the wing-backs infield to maintain a decent positional structure. If the Empoli forwards followed them into wide areas and sought to press the defenders from there the passing lanes into the wing-backs would be open potentially allowing them to progress play in the centre. It is more likely however that the Empoli forwards would hold the positions they were occupying before, this would allow Fiorentina’s defenders to play diagonally into the midfield pair who could then move forwards from a strategically good position. Furthermore the position the midfielders would now be occupying would put them out of zones that Empoli’s lines of midfield and defence would be comfortable moving into. The wide midfielders would be reluctant due to the presence of Fiorentina’s dual 10s behind them. With intelligent movement towards the flanks the front 3 could also make Empoli’s full-backs hesitant to move forwards to press, in turn giving the wing-backs more space to receive in the middle. Along with their roles in defence Livaja and Maccarone had interesting roles from an offensive point of view. They were responsible for creating an outlet in offensive transitions which they did with their diagonal runs towards the flanks. From here they would aim to move towards goal if possible or hold up the ball and release it to central runners such as Saponara. In general attacks and in the counter situations that they were able to move directly towards goal their wide positioning had some positive effects. Firstly it allowed them to receive free from immediate pressure due to Fiorentina’s need to stay compact and defend the centre. It also allowed them at times to run off the blind side of opponents who were focused on viewing the ball. One such advantage this had was making their runs more difficult to track due to the defenders’ need to view the ball. Furthermore from these wide positions they could move diagonally towards goal which was a generally superior dynamic to their opponents who often had to move towards them in wide areas. Many of these aspects were visible in Livaja’s opening goal. Immediately after the interval Sousa made a few adjustments as he sought to give his side a way back into the game. Kalinic came on for Mario Suarez with Valero moving into a deeper position and the forwards now being more flexble. At times Kalinic and Babacar would act as a front 2 in a 3-4-1-2 and at others they would take turns to act as a 10 alongside Matias in a 3-4-2-1. Theoretically one of the major differences this could make was a greater presence in the box for crosses and they began increasingly focusing on these to create chances. However it was two other changes that perhaps had the biggest impact. One of these changes was adapting the positions that the holding midfield pair took up in front of the defenders. Sousa did this in the opposite way to what I suggested earlier, with Vecino and Valero now occupying narrower positions which created some issues. Saponara alone could not cover the 6 pairing and if Empoli decided to use the forwards deeper to assist with this they would compromise their access to the defenders. Generally Empoli prioritised covering the midfield pair with the help of the front two, however on the occasions that Empoli’s forwards tried to press the defenders the midfield pair were available to receive passes behind them. Fiorentina now had a more consistent basis to progress the ball centrally as Astori and Tomovic (the side backs) could now look for vertical passes without immediate pressure, or could easily locate the midfielders if they were pressed. This reduced ability to press the defenders whilst covering the midfielders combined with growing fatigue meant Empoli gradually moved into deeper and deeper positions whilst defending in the second half. Furthermore the fatigue naturally meant the speed of their ball-oriented shifts reduced dramatically. This meant Fiorentina’s horizontal circulation was far more effective at creating routes for diagonal and vertical progressions. It also made their wing-attacks more dangerous as Empoli’s full-backs could not always get out to the flanks in time to stop Alonso or Bernadeschi from dribbling forwards with the ball. It was however another slight adjustment that led directly to Fiorentina’s equalising goal. Whilst Valero in the first half made some diagonal movements towards the wings these were generally isolated moments and seemingly not part of a general strategy. In the second half though they seemed to focus more on these runs between the full-backs who liked to step forwards to press and the centre backs as the ball moved out towards the flanks. This gave Empoli’s full-backs a little dilemma, would they move towards the flanks as before with little regard for the runner behind them or would they stay back with the runner allowing the recipient of the switch to move forwards unopposed? Sousa deserves credit for his minor adjustments that, along with Empoli’s fatigue, gave his side a foothold in the game. Whilst the changes were not dramatic they were suitable for their opponents and gave them a basis to break down the system that stifled them so well in the first half. As for Empoli the first half performance showed the strength of their defensive organisation as they comprehensively out-performed their opponents in the opening period. There should be some concern at how much they were affected by fatigue in the second half, and they could have gone home empty handed with the hosts dominating after the interval.